It is so luminous because a galaxy sitting in front amplifies its light - making it appear 100 billion times more dazzling than our Sun. This cosmic magnifying glass lay hidden between Earth and the supernova - and has now been detected with a telescope in Hawaii. The discovery, reported in the journal Science, settles an important controversy in the field of astronomy. 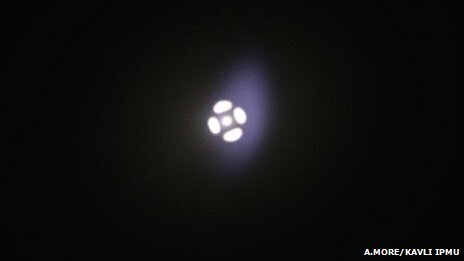 In 2010, a team of scientists observed the supernova, PS1-10afx, shining 30 times brighter than any other in its class. They concluded it was a completely new type of stellar explosion. But while there are a few, rare supernovas that have been found with comparable luminosities, there was something odd about this one, according to Dr Robert Quimby of the University of Tokyo's Kavli Institute. "PS1-10afx was different in just about every way. It evolved too fast, its host galaxy is too big, and it was way, way too red," he explained. His team had another idea. They ventured that PS1-10afx was a normal Type Ia supernova magnified by a lens in the form of a massive object, such as supermassive black hole, nearby. The only problem: "We had no direct evidence for the lens," said Dr Quimby. "Thus [our] explanation required a bit of magic... and scientists don't generally buy into magic." However, he reasoned that if there was a gravitational lens magnifying the supernova, this lens would still be there today - even though the supernova has faded away. To find it, his team used the Keck telescope in Hawaii to observe PS1-10afx's host galaxy. "Looking at the spectra we could check to see if there was light coming from two sources at two separate distances, which is what we found," said Dr Quimby. "There is a second, previously unidentified galaxy, hiding in plain sight in front of the supernova." 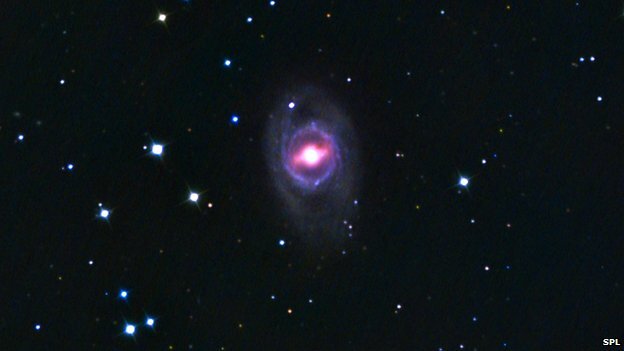 The lens galaxy was missed previously because its light was lost in the bright glare of the supernova, the authors say. "Although the lens galaxy is closer to us, it appears fainter because it has older stars that, like flashlights with old batteries, don't shine as bright," said Dr Quimby. The Universe was almost a billion years younger when the supernova exploded than when its light rays were bent by the foreground lens. "Although this warping of space time probably created four separate images of the supernova when viewed from Earth, we find that these likely appeared as a single source after atmospheric blurring," said Dr Quimby. The discovery could provide astronomers with a new tool to measure the expansion of the Universe. That's because PS1-10afx is the first supernova of its kind to be magnified by "strong gravitational lensing" - where multiple images of the supernova are formed - creating the extra-bright appearance. "Each image will arrive at a different time with the exact delay dependent on how fast the Universe is expanding. In principle, measuring this delay provides a direct way to measure cosmic expansion," Dr Quimby explained. Unfortunately, the scientists could not do this with PS1-10afx because it faded away before its importance was recognised. But now they know what to look for. "Our discovery implies there are many more gravitationally lensed supernovae that are barely resolved, like PS1­10afx," said Prof Masamune Oguri, of the University of Tokyo. "Our selection method can soon be applied to future surveys to improve our understanding of the expanding Universe."